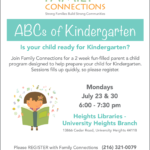 Family School Connection is a kindergarten-focused home-visiting program based in elementary schools. We connect with families, encourage their involvement with the school, and help them access community resources. Family Liaisons interact with parents as supportive peers and offer home visits, evening programs, and direct work with students in the classroom. This program supports a smooth transition into kindergarten. Held in the weeks leading up to the start of school, Kindergarten Kickoff helps parents and new kindergartners become comfortable with their new school, receive information about what to expect in kindergarten, and begin to build relationships with school staff and other families. 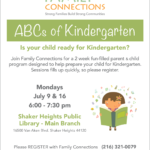 Parents can learn what is expected and obtain resources to further support their child’s transition from Kindergarten to 1st Grade with fun and informative activities. Increase parental engagement in their children’s education and involvement with the school. Promote children’s literacy levels and school readiness skills by engaging parents and children in play-based literacy activities. 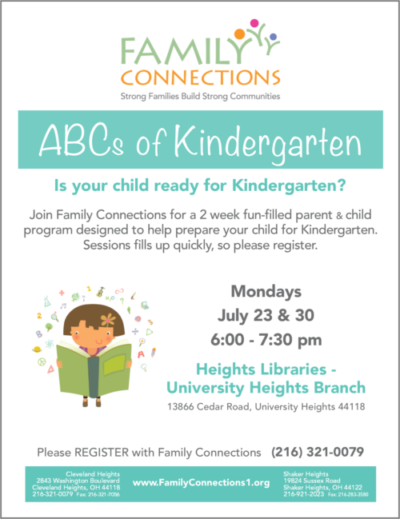 Help families establish routines that include increased conversation, parent-child activities, educational play opportunities, and reading time. Provide opportunities for parents to get to know and gain support from one another.